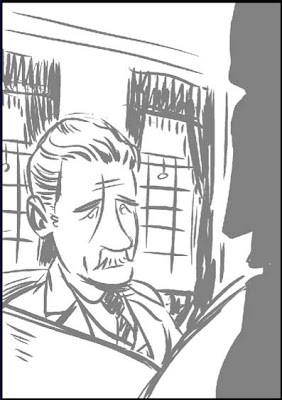 Here's a rough of Dr. Watson for one of the pages I'm working on right at this very moment for Hound of the Baskervilles. Thought I'd take a quick snap shot and post it here. The wet proofs for a handful of test pages arrived yesterday morning from the printers so I could see how the color would print and I'm rather pleased and excited. - (Being a reprint from the reminiscences of JOHN H. WATSON, M.D., late of the Army Medical Department), A Study in Scarlet. And it's that no small part of his genius that brings me to Dr. Watson and the Battle of Maiwand. Whilst many may know of Watson through Nigel Bruce's portrayal of a bumbling baffoon, Sir Arthur Conan Doyle portrayed Holmes' chronicler, Dr. John H. Watson as a capable and brave man - a 'whetstone' for Holmes' mind. The bravery of the English soldiers that fought in the Battle of Maiwand was noted by an Afghanistan officer. The British had lost and were down to 11 men. "These men charged from the shelter of a garden and died with their faces to the enemy, fighting to the death. So fierce was their charge, and so brave their actions, no Afghan dared to approach to cut them down. So, standing in the open, back to back, firing steadily, every shot counting, surrounded by thousands, these British soldiers died. It was not until the last man was shot down that the Afghans dared to advance on them. The behaviour of those last eleven was the wonder of all who saw it". Now, given that Watson survived he clearly wouldn't have been one of the final eleven (if we marry fact with fiction for a moment as Doyle suggests) but another matter cements his courage and devotion to my mind. In 'A Study in Scarlet' (re: above) it states that Watson was shot in the shoulder (wounded by a Jezail bullet), and its this wound that had him pulled out of active service. In 'The Sign of Four' (another of the books we're adapting), he makes reference to a war wound in his leg. Which was it, the shoulder or the leg? That's something that's sometimes been a matter of debate. Well, if our Watson served at the battle of Maiwand and if the description given by the Afghanistan officer is anything to go by then the answer's quite simple as I see it. It was both. Not only that, but Watson was already significantly wounded before he took the bullet in the shoulder which retired him from the battlefield for good. Had he, even wounded, tried desperately to save lives in the chaos that was the battlefield of the Maiwand? Watson was a courageous and devoted man and yet he himself is quick to note the devotion and courage of another! In factual context, Watson was truly an exceptional fellow. Prog 2009 is on sale today! And in it you will find the Stickleback Christmas Special I spoke of back in November. 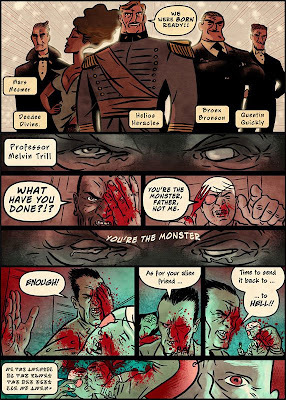 The story is called 'T'was the Fight before Christmas' which is by strange coincidence the same title given to the Sinister Dexter story Stickleback co-creator and original artist D'israeli debued with ten years ago as a colorist. For those following the references slipped into these stories, Fishpaste is not the only one I managed to sneak in. New plate up on WKRR? A little different to what I normally do. Not long now before the strip comes to an end and a new Round Robin starts for 2009. Just heard this morning that Oliver Postgate passed away peacefully aged 83. He created some of the best loved television for children, including the Clangers, Ivor the Engine, Bagpuss and Noggin the Nog. He's certainly been an enormous inspiration to me. Let's not think the world a gloomier place for not having Mister Postgate in it anymore, rather it's a better place for Mister Postgate having been in it at all. The memories he leaves behind for generations of children are filled with Soup Dragons and small green locomotives and for that all I have left to say is thank you Oliver Postgate. Thank you. Stickleback created by Ian Edginton & D'Israeli. 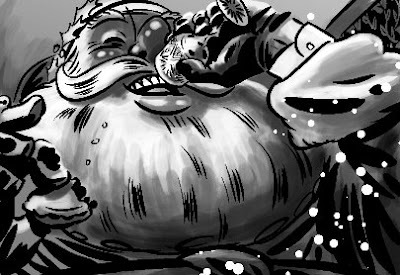 The cat is well and truly out of the bag so I may as well show you a sneak peek from the story I've drawn for the 2000AD Christmas special (Prog 2009) which I mentioned back in September. It's a festive Stickleback story written by Ian Edginton. Stickleback is usually drawn by D'Israeli who's artwork for the series is three things; absolutely gorgeous, distinctly Stickleback and a blooming hard act to follow. Many thanks to Ian, D'Israeli and Tharg for this opportunity. I had a blast doing it. PATERSON JOSEPH THE NEW ... POTENTIALLY THE NEW DOCTOR WHO? Thanks to Col for the heads up. I went down to London Town on Sunday to talk to Paul Gravett in front of lots of people at the ICA about Dorian and a little bit about Holmes, the first two pages of which you can see projected on the screen in the background of this picture. That's me on the left, that's Paul Gravett in the middle and that's Ian Edginton on the right. In other news, here's a review of The Picture of Dorian Gray from The Bookseller. 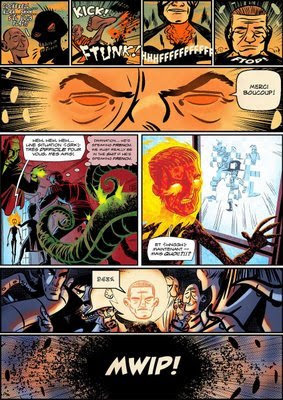 "Films and graphic novels have a lot in common – indeed I could have used much of this as my storyboards. It's terrific to see Wilde's work in this form and it's a great way to reach a wider audience. 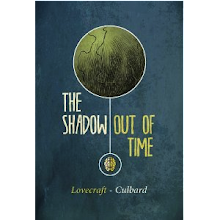 The visuals are bold and striking and the text very skillfully abridged." - Oliver Parker, director of 'The Importance of Being Earnest', 'An Ideal Husband' and the forthcoming 'Dorian Gray'. I arrived in Bradford just before midnight last night to find there was a problem with reservations and that I didn't have a room at the hotel I was supposed to be staying at. Unfortunately there were no vacancies in any of the other hotels in the whole of Bradford. So I had to get back in my car and drive all the way home again, not getting back till 3am. So, unfortunately due to these unforeseen circumstances the workshop I'd spent so much time preparing for had to, regretably, be canceled. My apologies to anyone who was hoping to attend. My new plate for WKRR? is up. Please go check it out. This is apparently what Harrison Ford said about George Lucas' script for Star Wars. Ah, the Psychohorizon, finally. An infinite corridor of time, space and the mind. Lots of pseudo psychoanalysis like Transference Sickness. Transference itself is a phenomenon found in psychoanalysis but has very little to do with void virgins. As correctly observed by Rob Davis in the comments section for this plate, this is a Poirot moment. Perhaps a game of motives and alibis is about to begin? We shall see. Don't know why but I decided this page was all about fours. There's four panels, four sentences and each sentence is four words long. 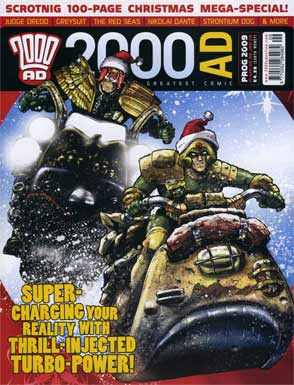 My work on the 2000AD Christmas special is done and I'm looking forward to seeing it in print. I've also got another 3 pager for something else that popped up towards the tail end of last week that needs to be done before the end of this month. More on that as and when I can spill beans. And now for something completely different. Here's a letter I found addressed to me which mildly amused me. "The Prince and Princess of Wales have asked me -"
They specifically asked. They said, "Henrietta dearest, do be a chum and write to that dear fellow and thank him for us would you. It was awfully kind of him to write to us and to spare a moments thought for us given how frightfully busy he is with all this and all that." Or at least that's likely the way I would have seen it aged nine. 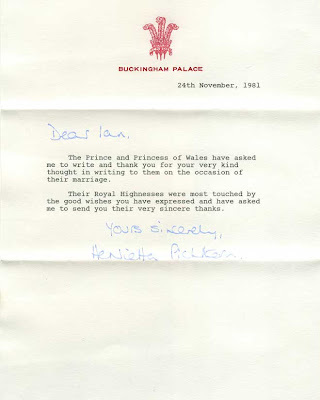 "Their Royal Highnesses were most touched by the good wishes you have expressed"
What the heck did I write that gave merit to a letter from Buckingham blooming Palace? Ch-ch-ch-ch-changes!!! David Tennant has just announced that he's leaving Doctor Who after the next four specials which will be broadcast over the coming year. These are the last two pages of WKRR? I've appeared on. Thought I'd show the full pages as Dave Taylor's gone to all the effort and done a lovely job of sticking the pages together. 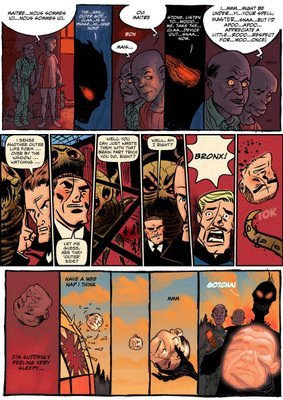 You can see all the full pages of the strip shown in sequential order over here. Got back from the Birmingham International Comic Show late on Saturday night. What a hoot! Got to meet up with the lovely folk from SelfMadeHero again, signed some books for some incredibly nice people who were all saying incredibly nice things. And the first copy of Dorian Gray that I signed was for Mark Buckingham and his wife Irma. I also finally met Sean Phillips and got up to speed with Criminal and managed to get a copy of Seven psychos. Oh, and I got a comp copy of The Girly Comic (from marvelous Jay and Selina at Factor Fiction) which has 'War Canary' in it in full color! And I hooked up again with my dear chums Dave Taylor and Colin Fawcett with whom I ate food and drank wine (we actually got a free lunch). Storyboarding, alongside character design and scriptwriting, is one of the key stages of producing a quality animation. In this two hour workshop, Ian Culbard (animation filmmaker with experience in directing commercials, television, and short films) offers an insight into the skills involved in producing effective storyboards. 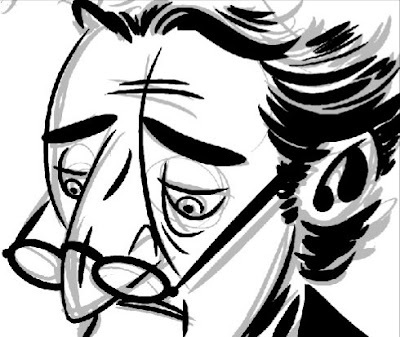 Shakespeare, Brontë, Wilde and Dickens are getting visual makeovers as comics. How does prose transfer to panels? What is lost, and found, in translation? Richard Appignanesi and Ian Edgington talk with their visualisers Mustashrik, Chie Kutsuwada and Ian Culbard, and John M Burns and Mike Collins discuss their versions of Jane Eyre and A Christmas Carol. Plus signings. So November's going to be quite a busy and exciting month for me. Snuck this one in late last night. Poor Bronx. I was listening to AC/DC's 'Back in Black' when I started inking. The last panel was drawn to AC/DC's Thunderstruck. I've no idea why I was listening to AC/DC at the time. I don't usually. But it certainly got me in the mood and thankfully spurred me on to finish this panel quite quickly. 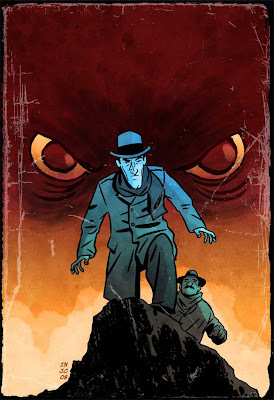 Work is well and truly underway on The Hound of the Baskervilles and momentum's picking up (we're a month in now). Here's an early idea for the cover (this won't be the final cover but you do get to see Holmes here, and an early Watson (Watson's nose is a little different now). We're shaking off the bumbling buffoonery of Nigel Bruce and the deerstalker and the Calabash of Paget and Gillette respectively. Is it heck. My money's on no. What do you reckon? Right. Big news. I've started work on my next graphic novel for SelfMadeHero and their Eye Classics imprint. I'm rather excited to be working once again with Ian Edginton who's recent book "Stickleback: England's Glory" was described by SFX magazine as a "modern-day Victorian classic". Over the coming months I'll be updating this blog with sneak peaks, probably a few tutorials and the like, all pertaining to the production of this book. 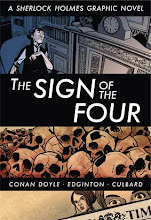 The name of the author who's book we are adapting is my favorite author, Sir Arthur Conan Doyle. And the title of the book is The Hound of the Baskervilles. But that's not all. We're adapting The Hound of the Baskervilles with a view to adapting all the books. We're doing the lot. The Hound of the Baskervilles is just the first in a series which if all goes according to plan will be released semiannually from 2009. More numerical homage on the WKRR? Going from The Mothman Prophecies Number 37 to The Prisoner AND Battlestar Galactica's Number 6 right the way across to the end of the universe with The Hitch hiker's Guide to the Galaxy's meaning of life the universe and everything with 42 and finally back to The Prisoner again with Number 2. Numerical nonsense aside, "Dickie Bird" is slang in this neck of the woods for "word" (so she's saying 'not a word' basically, for those not up on their cockney rhyming slang and not of the British Isles) and a reference to the fact that all the characters in this scene when they're not referring to one another as numbers are actually named after birds. I wanted to keep the inking effects very 'in camera' as they'd say in the film business, with regard to this plate. Basically, the frantic cross hatched shading level has moved from being something I would normally have dropped over the background on an overlay channel to being part of the actual finished inks (likewise speech balloons). I need to do more black and white work. Following Nigel Parkinson's wonderful curve ball on the WKRR? I stumbled upon this idea just as I was waking up this morning with an somewhat unexpected and quite ferocious hangover. 'Wake up, Number 37' is a pop culture reference type thing (pertaining to "The Mothman Prophecies" wherein a character called "Indrid Cold" (aka The Mothman) who seemingly exists out of time, says it as a warning to one of the characters in the film. It must have got lodged in my brain because as I was waking up this morning it sort of popped into my head like a booming voice. Like the echo of a dream that somehow overlaps into the first few seconds of the waking day. The number 37 is of course loaded with meaning as is every number and everything if you chose to follow the white rabbit down the hole. From the number of plays written by Shakespeare to a bad year for Antioch. From the first irregular prime number to the number of the beast (37 is 666 divided by its digits added together [37=666/(6+6+6)] ... and technically speaking, its the 'number of a man' associated with the beast, but that would mess up the lyrics to "The Number of the Beast" by Iron Maiden). 37 means everything and nothing at all. Will be fun to see who or what 37 is, presuming Nigel picks up on that as he's Huzzah'd the next turn. Watched 'Maestro' for the second time last night. A new 'celebrities making complete asses of themselves' tv show from the BBC but unlike previous 'celebrities making complete asses of themselves' tv shows, I rather enjoyed this one as it was about one of my favorite subjects. Classical Music. And it proved that conducting an orchestra is not unlike driving a ruddy great big tank laden with very large guns. Wonderful stuff. I love the Darth Vader Thriller dance. You'd have thought they would have let the Wookie win, right? LAST THREE PLATES FROM WKRR? AND AN EXQUISITE CORPSE! Here's the last three plates I did for WKRR? which oddly, when put together, even though they're divided by other contributors plates in the actual story, read straight through. Out of context, the three plates still wouldn't make much sense, but I do wonder if I'd tried this from the start if I'd been able to pull it off, having one through line in the story that could be read entirely on its own. Inspired by Dave Taylor pasting his plates together over on his blog. The work over on Cadaver Exquisito really is quite exquisite, so please do go check it out. I was able quite easily to work my way through the story with a translator widget (that's the glory of comics, not a lot of text). 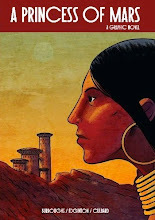 Their contributors include Bachan, Edgar Clement (both of whom have contributed thus far), Humberto Ramos, José Quintero, Patricio Betteo, Lucas Marangon, Francisco Herrera and Tony Sandoval. Rage incarnate indeed. Love how Hulk makes short work of Asgard's equivalent to the riders of Rohan by flying through the air and punching them off their horses. Nice work. See, you don't need a herd of stampeding Mûmaks after all. I'm looking forward to seeing this. Batman's going to be regularly teaming up with the likes of Aquaman, The Atom, Black Canary, Blue Beetle, Booster Gold, Doctor Fate, Fire, Flash, Green Arrow, The Green Lantern Corps, Huntress, Red Tornado and Plastic Man, with Diedrich Bader providing the voice of the not-so-dark Knight. It's also great to see Jaime Reyes as the Blue Beetle. Another Plate for 'Who Killed Round Robin?' This time hopefully further tying the Creature Constabulary and the Magical Hat into Zoctarian origins. This time introducing the not so cute and not so cuddly Kodoradomidion bounty hunters. As I currently see it they ride around the deserts of Zoctar on giant lizards hunting bounty. Initially I was working on this plate in blue, but I eventually figured that Zoctarian moonlight would be red, as you do, so I washed everything through with red photo filter. Also, dropping the old paper texture over the top (which has a yellowed newspaper look about it) and playing with color burn channels really made the lines around Uncle Tulpa zing. With all this talk of Gods and revelations I thought it only fitting to open this next WKRR? plate with writing on the wall (Daniel 5:1–31). Carrying on the unclaimed log entry from the previous two pages, I was sort of wondering when I did those if anyone would associate them with the character Penney or attribute them to somebody else. 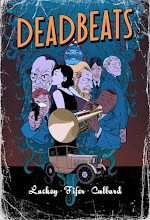 And I've been wanting to bring "the Detective" back into the story for quite a number of pages now, and suggest perhaps how such a story could have such a thing as a Creature Constabulary and magic hats. 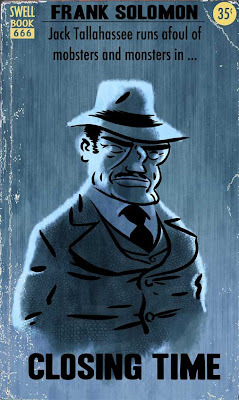 When I first introduced 'the detective' (who has a name of course, Captain Noah Arkright), I actually had planned to introduce three. Basil Rathbone, Margaret Rutherford and Sidney Toler alikes, getting under one another's feet... but that would have been a nightmare so I'm glad I didn't venture further beyond the signs saying 'turn back, that way madness lies'. I settled for a cross between Basil Rathbone and Gregory Peck instead ... sort of. Oh, one last thing - there's a joke hidden away in this one... it's written in Zoctarian across the ship as it passes overhead in the second panel. 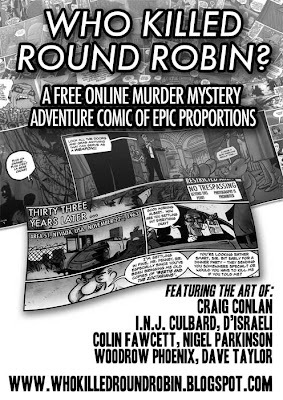 If you've no idea what I'm on about then you've not been reading 'Who Killed Round Robin?' Shame on you. Who watches the Watchmen? Well, pretty soon we'll all be watching the Watchmen as it hits cinemas March, 2009. I don't think I've ever watched a trailer so many times over. Wow. The Doc Manhattan transformation scene is really quite something. Go and watch the Watchmen trailer for yourselves.... thanks to Apple. Right then. Here's the process I used to create Plate 2 of Page 26 of "Who Killed Round Robin?" Starting with the concept - I wanted to elaborate more on what happens to people who witness the birth of an Outer God without the proper protective eye wear and seized my chance when I noticed that because of Woodrow Phoenix's perception of what I'd drawn earlier he'd drawn a previously faceless character with a face again ... and from that I got my idea. How we perceive one another's contributions is obviously just one part of what shapes the story, with people interpreting what has gone before in ways that a contributor might not have imagined in the first place. So I figured I'd find a way to cement the original intention a bit more concretely (excuse the pun). Also I wanted to reintroduce a concept contributed by Colin Fawcett all the way back on page Page 15 (plate 3). We'll likely catch up with Cockrell and Stone's progress at some point (one would certainly hope), but I quite liked the notion that people could be used like trained circus fleas. So I started sketching. And as with most of my WKRR? contributions I just have time for one shot at it, so pretty much what you see is more or less what you get. Straight out of the tin, as 'they*' say. 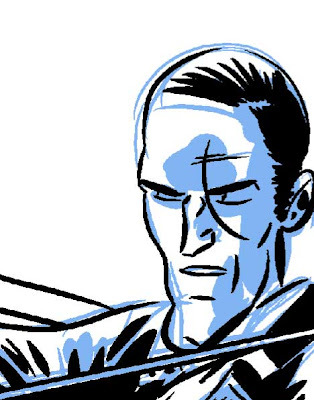 .... using Manga studio for the nice big brush lines. 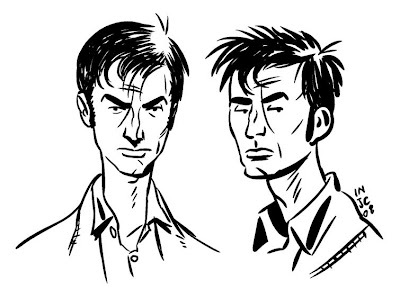 Manga Studio is all levels of awesomeness. Try it out. Took me about fifteen minutes to ink fully then on to the crosshatching. I then exported the file into photoshop (you can export your work, layers intact, straight out of Manga Studio... did I mention how marvelous Manga Studio is?) and did a quick color rough which, when I'm doing round robin work is finished colors... but I do probably take a little while longer coloring than I do inking. It's the bulk of the work in fact. I basically color the whole thing quite baddly, with only a rough idea in my head of the contrast I want. So the colors will be quite primary to begin with. Then I isolate areas of the color and tweak them using 'photo filter' in photoshop. Which washes colors through with either a uniform warm or coldness etc. 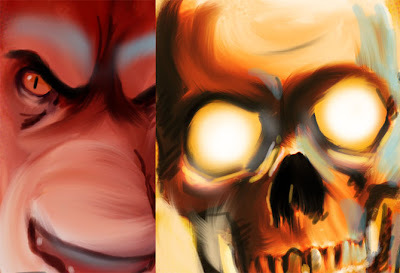 Cyan photofilter is great for deadening flesh tones if you're doing a zombie comic etc. I then pass the whole thing through a photo filter tonal wash to ensure the color is equally distributed. So the over all image feels either warm or cold or dead even. I enjoy this process way to much. It's my favorite part out of the entire coloring process. No idea why but its totally my bag. In the previous panel Penney has set the alien on fire so we loose the usual colors for this environment. And then I take my cross hatched layer, remember that? Hopefully I haven't lost you by now with all my talk about photo filters... anyway, I switch that to an overlay channel and it burns over the image quite nicely. 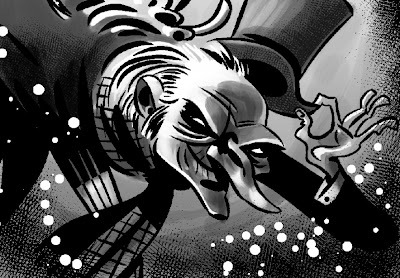 Then, on a layer over the original inks I drop the oppacity and work glow into the eyes of the damned and the lighting. I add two additional layers, one with a texture over it which I put on a soft light with high contrast... it's basically a mottled texture that actually makes any overlap in the color seemingly bleed, so it gives everything a marker effect or water color effect giving the color a pinch more depth. I also have like an old newspaper texture which I drop over the whole thing on a multiply channel, which means that anything white is now creamy colored, like aged paper, and pulls the image together a bit more in terms of tone and depth and all those bells and whistles. And lastly I add lettering, returning once more to the log entry of the previous page, describing in some detail what happens to the skin of a 'witness' who is unfortunate enough to see an Outer God being born (or to even meet one at all). I also use words of Yiddish origin for sound effects, quite specifically choosing schmaltz (which you may know as being used for 'excessive sentimentality' but is also the word for melted chicken fat, which I thought quite appropriate for the sound of someone's face falling off) and schlub (which is a clumsy, stupid, or unattractive person ... not very nice, I know). For the finished thing, click here. Much of this post won't make sense unless you're reading the critically acclaimed (it's had some criticism and some acclaim, so technically speaking it's critically acclaimed*) "Who Killed Round Robin?" so either get yourself over there and start reading, or nod knowingly and pretend you know what I'm talking about. Here's the inks for my new WKRR? plate (click here to see the full color version). I decided here not to show the Outer God - we've had glimpses of it so far, nothing too detailed, and I thought it more horrid at this point in the page to show the effects of looking at it rather than showing it. And of course the introduction of journal notes... although who's journal notes remains to be seen. I named the burgeoning regenerating aliens "Dren". As in 'children', because they've always looked quite eerily childlike. Also I was rather curious as to why Penney wore tinted specs. Well now we know. With this week's Who Killed Round Robin? I snatched up the opportunity to follow myself again after poor Dave Taylor had to bow out at the last minute. Got to play around with the legend of the Angel of Mons, in which angels supposedly protected the British army during the Battle of Mons at the start of The Great War. Arthur Machen (an interesting chap - member of the Hermetic Order of the Golden Dawn) had a hand in creating the legend when he wrote The Bowmen (published in the Evening News a month after the battle), inspired by accounts he'd heard from the front line. In the story phantom bowmen from the Battle of Agincourt are summoned by a British soldier calling on the spirit of St. George. The Battle of Agincourt again is of notable significance. It's incorrectly associated with 'flipping the bird', that most popular of obscene hand gestures. Apparently the French wanted to cut off the middle fingers of English bowmen so they could not use their bows (a cunning plan!). When the English won they displayed their middle fingers to show they still had them. Nonsense of course, but then so was the Angel of Mons. I thought it interesting though that bodkin point's (the arrows used by longbowmen at the Battle of Agincourt), were fired in sun blotting volleys at the French and yet St. George in Machen's story sent the very same bowmen to be allied with the French in order to defeat the Germans. Who Killed Round Robin? has been going for six months now as we round the corner at 23 pages with no end in sight just yet. It's something that allows me to try something new - or rather hone a direction for my work. Of late I've been cross hatching like crazy which you may notice if you look very closely (click on the image above for a closer look). WKRR? also allows me to practice my use of color. 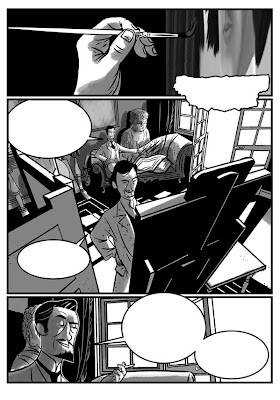 Odd to also think that at Page 1, Plate 1, which I'd drawn last new years eve, I'd only drawn 5 pages of Dorian. I've contributed a total of 14 'plates' to WKRR?, over which time I've completed a 119 page graphic novel and have tentatively started work on another. These last 6 months have proved the most educational, I've learned a tremendous amount and am absolutely ravenous for more. Over the next couple of days or so I'm preparing my pitch for Zuda, something I've been talking about doing for ages (and not exactly been putting off either) where I'll hopefully be able to put some of those lessons to good use. I cannot wait to see the new Incredible Hulk film out later this month. I missed Iron Man when it screened, but I'm setting a date with the big green guy. I LOVE the Hulk and I cannot recommend enough Peter David's run on the The Incredible Hulk from Marvel comics back in the nineties. Truly amazing series. I was more than a little disappointed by Ang Lee's effort, so I'm hoping this new version doesn't Mister MgGee me. Speaking of Mister MgGee, I love the inclusion of the theme tune from the glorious Bixby tv series at the end of the trailer. Awesome. I love my Pulp and Noir. 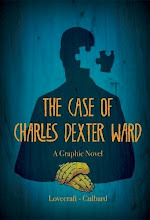 A fictional cover for a fictional book. A work of fiction in every sense of the word. Frank Solomon's my chosen pen name if ever I become a 10,000 word a day pulp novelist. Jack Tallahasse's someone I'm going to have to work with some day. Just playing around here with textures and light really as my work seems to be increasingly moving in this direction as can be seen in my latest Round Robin contribution (I got pretty obsessed with the number 3 while I was working on it, see how many references to three you can spot and what they all mean). It's funny. The way I work just leads and I follow. I've no idea where it will end up but that's all part of the fun. Walt Simonson gave a talk at the Bristol comics expo this year about the X and Y axis of creativity and how your work changes over time and you're in constant pursuit of getting it right. There's certainly an importance in never attaining that goal. It's all about the journey. As I was working on Dorian, I learned a heck of a lot about myself as an artist over the course of 119 pages. I'm sure anyone would. 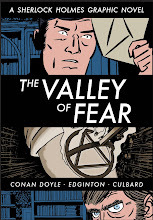 And the next project Edginton and I are hopefully doing with SelfMadeHero will certainly reflect all that. Got a lot of work to do over the coming week or so. Pitches galore. The Bristol Comic Expo was a great way to wind down after Dorian Gray. Finally met with Dorian's publishers for the first time. Working remotely as I do, I don't always get to meet the people I work for. So it was nice to meet the good people at SelfMadeHero at long last. Conversation has already started moving on to the next big project and I'm currently doing some preparatory work for that along with Ian Edginton. Hopefully work on that will start proper soon. 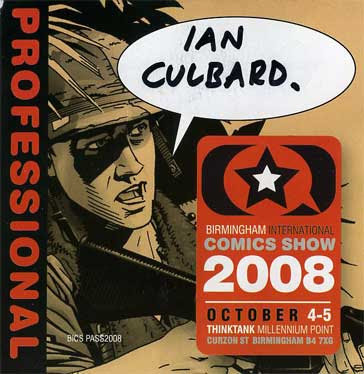 Meanwhile I'm putting work together for another five projects, two I'm doing on my todd, one with Jay Eales of Factor Fiction, another with Ian Edginton again, but that'll come after the prep work for the next SelfMadeHero outing, and one of which is with Round Robin collaborator Colin Fawcett. More on that too as it comes in, all I can say right now is it's a corker.